Our first Christmas tree has to be a real show stopper. This year is no different I’ve gone for a more traditional colour scheme and used red, gold and green the ultimate Christmas colours. So, here’s how it happened. Photo, Miss Haberdash Christmas, 2017. 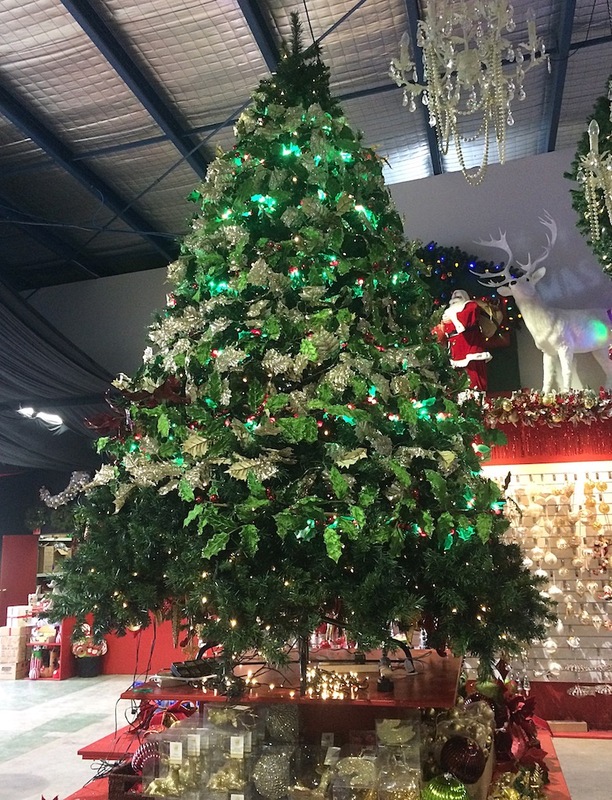 This 10ft tree twinkles with 1,200 warm white fairy lights. Installing them is a time consuming job but very worthwhile if you love the look. Starting at the very top I layered garland in alternate colours. I choose this pale gold leafy garland and a velvet holly garland in bright green and red. Before adding the holly garland I twisted holly leaf lights around the garland an easy way to add extra light and colour to your tree. Medium size decorations like these gold boxes, baubles and poinsettia were added next, the size of your tree should dictate the size of decorations used. Finally I added white beaded garland to create depth, lift the colours and tie the overall look together. These were the main ingredients but you can now begin to add extra special ornaments like glass baubles and larger decorations like these boots. We’re lucky to have Santa Claus and Mrs Claus by Katherine’s Collection to complete the look. Hello, I’m Alison the creator of Miss Haberdash Christmas. I’m a Melbourne designer who specializes in Christmas decorating and I’d love to inspire your festive style.